Farmgirl Fare: It's A Boy! It's A Girl! It's A Boy! It's A Crazy Day On The Farm! Just before dawn, my beloved (and wiped out) Doll Face had this sweet baby boy out in the 10 degree cold. 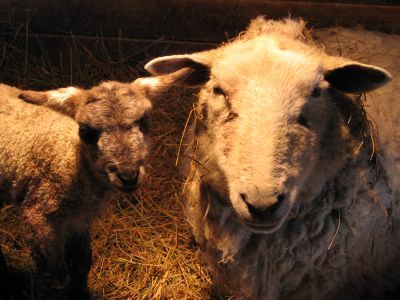 Here they are snuggled up under the heat lamp in their bonding pen (hence the odd lighting in the photos). Meanwhile. . . You all remember Martha, don't you? Well, this picture was taken this morning, and she would like you all to know that it's not fat (or fluff). . . I've been watching her for weeks, even bundling up and clomping down to the barn around 2am for the past ten nights to check on everyone--but especially her. This afternoon I had to make a mad dash to town (I haven't left the farm in a week), and I was sure Martha would choose that time to go into labor. I ignored half my To Do List and was gone barely over two hours. 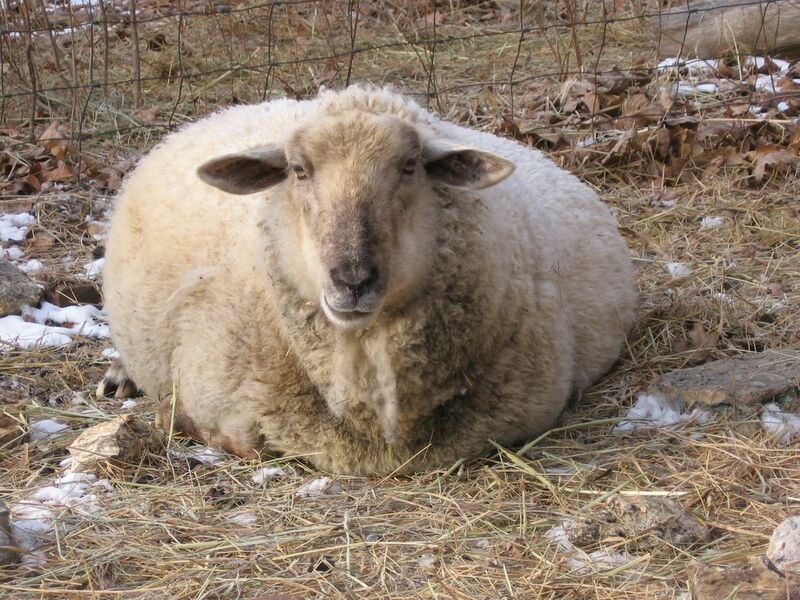 I sped down the driveway, screeched to a halt in front of the barnyard, and saw Martha cleaning up a lamb that was just a few minutes old. 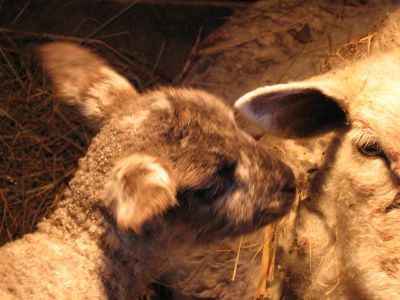 By the time I had zipped up to the house, changed my clothes, and scampered back down to the barn, the second lamb was on its way out. 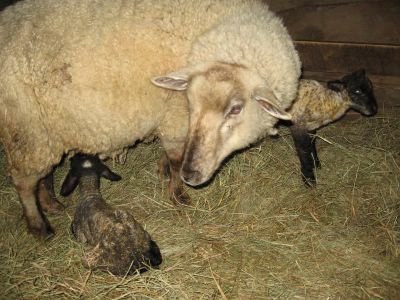 All three are now happily snuggled up in their bonding pen next door to Doll Face and her baby. I think that's just about enough excitement for the day. Of course, I'll be heading back down to the barn in a few hours, and Mary and Frederica were looking awfully close. . .
Oh my. How lovely they all are. Now I guess there'll be a big whoo-hoo about naming them and everything. Wow. What an amazing time of year this must be at the farm. Wonderful photos. They are SO cute! If you have a moment one of these days when life is not quite so crazy, you should read, "The Dogs of Bedlam Farm" by Jon Katz -- non-fiction about a guy that owns border collies and buys a sheep farm in upstate New York so they have something to herd (now there is real dedication to your dogs!!). Anyway -- he's got some great descriptions of lambing season -- which of course happens just during the coldest days of winter. I think you'd really appreciate it! Congratulations! Let the naming begin! How exciting!! What a great day on the farm! Why can't chickenz lay twin eggs? they are sooooo cute :)!!!!! Congratulations to all the new mamas! Oh my! Look at all the adorable little fuzzy ones! Martha must be much more comfortable now. She was looking very, um... fluffy! We can, Jeff. They are double-yolkers. New life in the still of winter - wonderful! Adorable! As much as I love animals, I never really thought sheep or donkeys were particularly cute until I started reading your blog. Now I just want to hug them all! 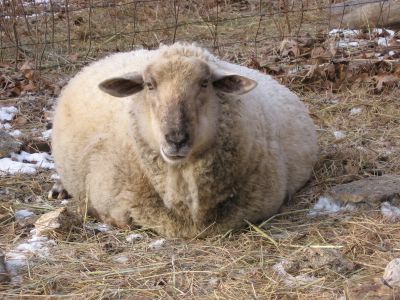 So does this make you a Lambma? Sorry I had to say it! They are just so cute! Such wonderful moments to experience and thank you so much,Susan,for bringing across these lovely pictures. What wonderful pictures. What an exciting day. And more to come. Life on the farm, wow. Wonderful headline! I got all excited just reading it! And the photos are just fabulous! Here's a few more to celebrate - !!!!!!!!!!!!!!!!!!!!!!!!!!!!!!!! Susan, the pictures are all so wonderful. Thanks for sharing such a great miracle of their birth, and all the animals & chickens. I love them. A very belated Thank You! to you all for your kind words and hearty congratulations. 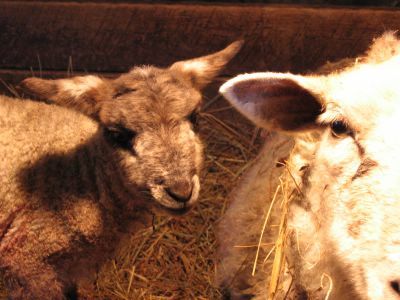 This is, indeed, an amazing time of the year on the farm--no matter how many years have gone by and how many lambs have been born. I would also like to offer a warm Welcome! to those of you who are new visitors and/or new commenters. It's wonderful to hear from you. That book sounds delightful. I will definitnely have to see if I can track down a copy. Thanks for telling me about it. I don't think I'm up for any naming contests in the near future (and how could anything possibly top the last one? ), but I will be announcing something having to do with naming (and everyone's participation) very soon. Despite what Jeff (the king of bad puns, etc. himself) thinks (*grin*), I think the term Lambma is so cute--and I've never heard it before. Joe has now started calling me that. Again, thank you all so much for taking the time to write.